William Faulkner, Anne Lowe's grandfather, was the original tenant at 106, Willifield Way. He was a Post Office employee and had previously lived in Perrins Courf Hampstead. Edith Lilian, Anne's mother was born in Hampstead, The two pictures of little Edith in the back garden of 106 must have been taken during the first year of her living there. Francis Aylward, Uncle Frank, was born at 106 on 2l/4/1909. The famly group was taken in Hasting, where they holidayed. 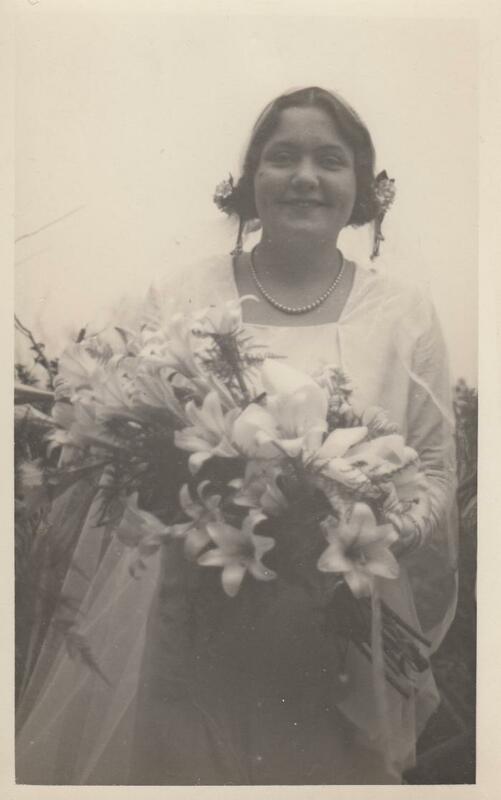 The wedding picture was probably taken in the garden of 106, Edith was married to Ernest Brown at St. Jude's on 5/l2/l931. The card inscribed Yours truly A Refugee of 1914 is most probably of one of two Belgian refugees who stayed with the Faulkner's at 106, Willifield Way in 1914. The three cards of the Whitehead family were given to me by Miss Ethel Whitehead. Their father and mother were also original tenants in 63, Willifield Way, where Ethel was born and lived all her life. These were taken at a time when being photographed usually meant going to a photographic studio, hence the post card format. The pictures could then be posted to friends and relatives at the cost of a halfenny per card. The Taylor's were neighbours ofthe Faulkners in The Square, Hampstead and also moved to the Suburb. The Clifts were next door neighbours to the Faulkners at 108, Willifield Way. The Rev. Basil G. Bourchier. M. A First Vicar of St. Jude's in his Royal Army Chaplains uniform. Commissioned Chaplin to the 4th (city of London) Battalion:, the Royal Fusiliers August 1914. He did not join the regiment, he was attached to the Red Cross. He went to the Westem Front along with the Rev. Rushbrooke, minister of the Free Church the same month, they were captured by the Germans and released the following day. Postally used 1915. The Lord Bishop of London Dr. A. F. Winnington Ingam was one of Henrietta's group and he has Winnington Road and Ingam Ave. named in his honour .